When creating a New project you are asked to configure which modules are required and defaults for the project. These options can be changed for the project at any time by clicking Actions -> Edit Overview. 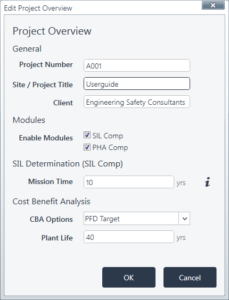 ProSET® allows you to record an overview for each specific project, select which modules to use (SIL Comp or PHA Comp) and set certain parameters for the project. The Project Overview also allows the user to select how the Cost Benefit Analysis (CBA) is carried out, either by using the PFD target or the calculated PFD from the SIL verification. Provide information about the project. This information can be used to pre-populate sections of your report using Placeholders. ProSET® comprises two modules, PHA Comp and SIL Comp®. You can choose to disable a module if you do not need it for the project. Check out the Software Overview for what functionality is availabe in which module. If you turn off a module after having used it the information is NOT deleted. It will be there again if you turn the module back on. Plant Life – The expected lifetime of the plant (yrs).